Let’s be honest… most of you out there do not practice with a purpose. I would wager that most don’t custom-tailor workouts with a specific purpose in mind either. Hitting the gym without a desired outcome is wasted effort. But what if you did practice and workout with a specific purpose in mind? How different would your game be? Think about how you practice now. Do you practice with a specific purpose every time you hit the range? Do your workouts contain the essential elements to stretch, strengthen, balance, and make your swing more powerful? I’m here to tell you that mixing together golf and fitness for a specific goal is a good idea. This cocktail of goal specific golf drills mixed with golf fitness can’t miss. … recently, I began experimenting with coupling specific drills and exercises into my regimen. The results have been great. I know what I’m working on and I can see and measure the progress. Last month, I wanted to increase my endurance. I used my Shed Pounds to Shave Strokes workout, ate better, and began walking the course more. I set a goal to be fresh on the last 9. 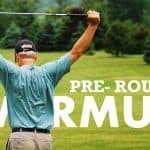 I used a golf specific workout designed to build endurance and burn fat. I walked the course while playing. I lost 10 pounds of pure fat and hit my goal. I’m now sitting at a solid 11% bodyfat. Set a goal for my golf game (next month will be posture, balance and tempo). 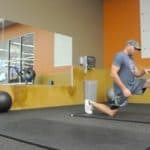 Use a golf specific workout and exercises to assist my goal. Use goal specific drills, giving me focus and clarity when I practice. … then I take action. … the reality is most of you won’t be able to maintain that posture dynamically through your swing. That’s a tough pill to swallow for most people. The reality is, this is easy to fix… if you make the effort. All this week I’ve created the Perfect Posture Cocktail (PPC) for you. We first learned 4 fundamentals to help you break 80, 90, or 100. Then we singled out posture and learned why it is so important to our golf game. Next, received a golf lesson from a PGA Teaching Pro on how to set up with perfect posture. Yesterday, I gave you 2 exercises, 2 stretches, and 1 mobility drill to obtain dynamic posture. 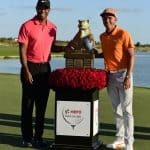 This workout is my best selling workout of all time and complements all four of the fundamentals Brent Cryer, PGA revealed to us. Working out at the gym is one thing, but actually working out for golf is another. Power. Balance. Endurance. And, flexibility are all required elements to pull off proper posture and improve our swings. You can’t fire a cannon from a canoe. I will then GIVE you my “Shed Pounds to Shave Strokes” workout system. That gives you 5 months of golf specific workouts. Start August 1st and have workouts that last until January 1st. So do it now as I’m only going to do this for 20 golfers. Just 20 golfers! After that, that’s it. No more. Nada. P.S. Don’t forget to email. Get the 30 Yards or More in 30 Days or Less program then shoot me your receipt along with a short note about your goals with your golf game. P.P.S. Tomorrow, I’ll be posting more drills on posture that you can take to the range.. I meant to post them today, but I would like to give you 3 or 4 really solid ones to help get the address position solid for you.